Have you ever heard of an Ohio Star? How about a Nine Patch? There are a lot of different quilt blocks that have fun names. Some have more than one name, maybe because they were created by different people around the same time. One of these famous quilt blocks anyone would recognize is the Double Wedding Band quilt. It does have other names, but the interlocking image of rings is very clear. There are a lot of myths and legends about this quilt and many of them involve a wedding or at least wedding rings. Nancy received this beautiful double wedding band quilt from a family member. It was clearly old and all hand pieced. Because we know that many quilters in the past would cut up old clothes, we can only guess where all these fabrics may have come from. Let me tell you, a Double Wedding Band quilt is a great way to use up a stash. To finish this quilt, Nancy asked me to quilt it with another classic quilting design called an Orange Peel. This is a pattern that involves a lot of continuous curves. It therefore sort of echoes the rings in the double wedding band. It is a lovely pattern for adding truly delicious texture to a quilt without being distracting. I think it looks lovely on this great old quilt. 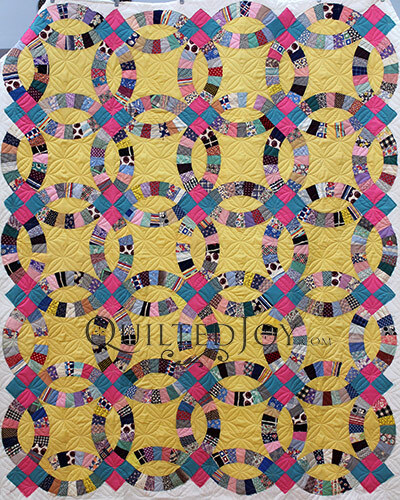 Despite the tremendous amount of curves, a double wedding band quilt can be a lot of fun to piece. If you are interested in trying one you can search online and find multiple ways to go about it. One of the ways, we can help you with. We rent our AccuQuilt Studio Professional Die Cutter with a double wedding band die in our Louisville, KY studio. This will help cut all of those little pieces faster and more accurately. The key to remember is to pin everything. In short, you can be the family member that creates one of these classic quilts for someone in your family to receive and cherish. Previous post: I’ll be a Guest on Pat Sloan’s Podcast! Beautiful! Was this a pantograph?